The superior 36 oz. nylon reinforced vinyl facing has a higher tear strength than equivalent weight hypalon. The chemically sealed ends prevent moisture infiltration. It is mounted on and bonded to a durable wolmanized wood and contains a full height air escape tunnel. The unit consists of a three (3) piece construction (12" high; sides - beveled sides with 9½" width at the wall and 12" width at the face) and a through the wall installation kit that is included. 5" maximum compression is recommended. 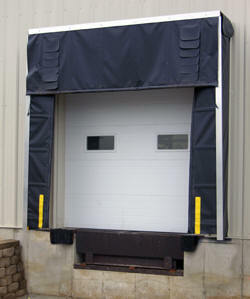 Application with a flush dock to building in conjunction with an Edge-O-Dock use a twenty (20) inch projection Dock Seal. To ensure proper size complete and fax the survey sheet below. Units are non-returnable. Print and fax this Dock Seal & Shelter Survey Sheet (pdf) to the factory for a error free quote. Units are non-returnable. 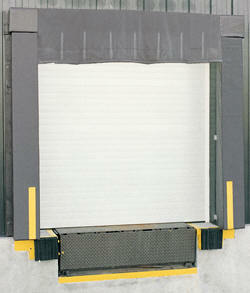 The Dock Seal/Shelter Combination is used with a 96"W x 120"H door. The top header is constructed of wolmanized lumber and is built with a slope to allow for water run-off. Header measures 114"W with a 30"L drop curtain. Side (verticals) measure 120" tall and contain high density foam mounted to treated lumber. The verticals are mounted on wooden boards (the face of the vertical measures 12"W and tapers to 9½" at wall) allowing wall mounting down the length of the vertical pieces. Application with flush dock to building in conjunction with an Edge-O-Dock use a 20" projection Dock Seal. To ensure proper size complete and fax the survey sheet shown below. Units are non-returnable. 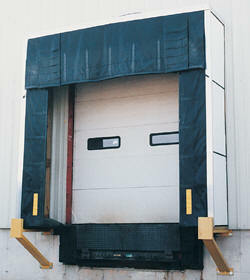 The Dock Shelter is used with doors up to 10'W x 10'H. 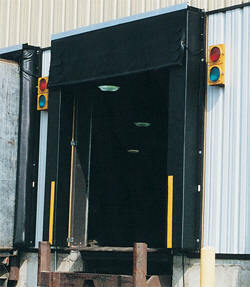 The dock shelter reduces oversized doors to match truck openings. The long wear fabric is highly resistant to abrasion and tearing. Fiberglass staves are sewn into the flaps. Seal is formed along the sides and top of trailer when the vertical and top panels are pushed inward by the trailer. Recommend minimum 10" trailer penetration for a good seal. Supporting structure is made of 2" x 4" wolmanized lumber. The top header piece measures 132"W and contains a drop curtain which measures 36"H. Two vertical pieces measure 126" tall with vertical flaps measuring 21"W. When installed, the shelter will close the door opening down to 90"W x 90"H (between flaps). 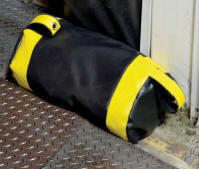 Includes two yellow steel guide protectors and foam-filled corner pads for extra sealing action. Units are non-returnable. 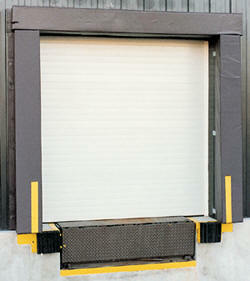 Print and fax this Dock Seal & Shelter Survey Sheet (pdf) to the factory for a error free quote. The Retractable Dock Shelter fits up to a 120"W x 120"H door. Independent manual scissor mechanism allows shelter to retract with the trailer keeping the shelter square. The design also eliminates the need for rigid steel guide protectors. The reinforced 40 oz. black vinyl-coated nylon flaps close the opening down to 90"W x 90"H. The 36" header curtain has armor pleats for extended wear. Shelter is black with aluminum edge trim. 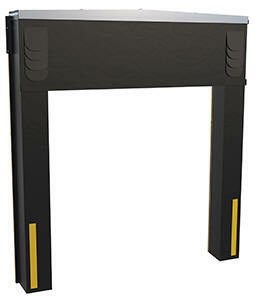 Optional Draft Pads, model D-520-24-DP, help prevent air from coming up underneath the dock flaps. Units are non-returnable. D-SIDE Dock seal sides between 97" and 120"